Goldfish are temperate water animals... NOT tropical. Though they can tolerate higher thermal regimes, being in hot water lowers their resistance to disease and greatly shortens their lifespans. This being stated, it's better that temperature not fluctuate too much/too fast, rather than be at any given point. Ideally... 60-75 F.... with only a few degrees change diurnally. Yes; they can live at near freezing and for periods of times (days, weeks w/ aeration) up into the high 80's F.
But could find any statements about ideal temperatures for goldfish. The tank is registering 61.5 F and I want to know if I should get a heater. I check Ammonia and Nitrate about every month or two—latest readings (for a couple days ago) were Ammonia 0 ppm and Nitrates 10ppm. Our water tends to be slightly hard, but I don’t mess with it since it’s not too off. I try to clean the tank (roughly a minimum of 20%, never more than about 40 or 45%) once a week... Now and then when I get really busy, it will be every other week. I rinse the filter media each water change in the old tank water. I live in Wisconsin (Mid-west USA, near the great lakes) and we’ve been having a wide temperature range the last month or so—but overall, it has been somewhat cool—So my fish tanks have stayed at “happy” temperatures—never exceeding about 74 or 75, at most and even having the heaters pop on during a couple very cool nights (My Goldies heater is set to about 72). This week, we’ve had a hot streak and in about 2 days time, my Goldies tank went from around 74 or 75 up to about 80 or 81 (unfortunately for us all, we don’t have air-conditioning) Of course, when outdoor temperatures are in the mid/upper 70’s, I stop using the fluorescent lighting, hoping to prevent the water from heating too much. It isn’t noticeable until she turns up toward you to eat or swim to the surface, which I think is why I hadn’t noticed it because I’ve been feeding them without the light. While the room is pretty light most of the day, it still is a lot darker in the tank. Can you tell me what you think may have caused this? Could it be the stress of the sudden temperature change? (A 4 or 5 days ago, we were having about 40 at night as a low, and now it hasn’t been going below 70 at night and has been upper 80’s (even low 90’s) during the day—so we’ve had quite a change—though I do still have all the tank heaters plugged in for those cold nights.) Does this sound like septicemia? Her fins are totally clear—no red streaks or red veins—nothing else unusual anywhere on her body or face/eyes/mouth. My first reaction was to put another tank cleaning on my to-do list for tomorrow or the day after (I changed roughly 40-45% tonight after discovering this issue), but I was wondering if I should do more at this point, or just wait and see what happens, since the fish is still acting completely normal and still eating? The only thing I can think of that has been different in the last week is our temperatures fluctuations. The other 3 fish all look and act totally normal and have no spots, of any color or type, anywhere on them. Thanks so much—You guys (“guys” used in such a way as to include girls as well) are fabulous—Always putting the fish (and getting the correct info out there) first! Thanks so much-- Very reassuring! So glad I wrote! I have a quick question on heaters, which I'm hoping you can help me with. I'm presently looking for a new heater for my freshwater goldfish tank (120l), because the one that came with the tank only goes down to 20 degree Celsius and I'd prefer something that has the capacity to heat to 18. Over the years I've noticed a few remarks (mostly by Neale) recommending or warning against particular brands, but these have proven very hard to find with the search function because I regrettably didn't keep a note of the names. The freshwater heater FAQs didn't have what I was looking for either, and the search function did provide me with a very helpful article on recommended tropical tank heaters but not with a counterpart for cooler tanks. I was therefore wondering if you might kindly provide me with a recommendation for a brand(s) and perhaps also a note of which should be avoided, based on your experience. Thank you very much for your time, and thank you as ever for the fantastic site. I can't tell you how much I appreciate your help (direct and indirect) over the years. Many thanks for your help, that was ideal (and one scary video!). Unfortunately my living room is often below 18C - downside of being a student in a northern latitude - so I think I'll check out the Eheim range. Hope you enjoy your weekend! I have a black moor and a golden apple snail in a 20 gallon tank. My questions is related to temperature. I see on your sight that it says that goldfish are cold water fish, but it still seems you think they will be happiest at a low temp of 65 degrees from a range perspective. However, it also says they can tolerate lower than this when outside in ponds. How much lower, and for how long? For the golden apples, it seems 65 is also a kind of low end of the range, but they will die when it gets colder much easier than the goldfish. It seems at 50 degrees they will reliably die, but the goldfish will just be 'unhappy'. My tank is in my basement, which is partially heated but gets much colder than the rest of the house in winter. I have not had the tank for a winter yet, so I don't know how cold the water will get in the basement, so I am monitoring it. It was at about 67 degrees over the summer, is now closer to 65 degrees. I would prefer NOT to have to get a heater, even if it means taking the snail upstairs for the season. How low can I go for the black moor this winter in terms of temperature and still be a "good" fish owner? At what level is it cruel, and at what point may it die? Even if I do get a heater, I want to keep it relatively cool, and only heat as much as I need to. How low can I go for the snail before it will be truly bad. They say it will die at 50 degrees, but would say 55 degrees still be OK for a few months over the winter? <Too cold. What is harmless for a few days can be lethal across weeks or months. Think about where an animal comes from, and act accordingly. If I let the water get colder than 65 degrees, do I need to feed the black moor less, more, or the same amount of food? I realize they are not mammals, but still thought I would ask to see if I should adjust feeding based on the temperature. Wow, thanks, the longer I own these fishes the more I feel like a scientist in training. I'll checkout the snail sight as well. I doubt I would get a snail for my goldfish tank again knowing what I know now. It sounds like your advice for the black moor is that if it is in a range between 51-59 degrees in the winter I should not feed it much, but continuing to feed normally it if 60 degrees and above. At 50 and below it would be bad for the moor, but I should not feed it at all if it slips down to that range until I can heat the water higher. Can you define not feeding it much? Lets say it is at 55 degrees for 3 months. Would I feed once a week? Once a month? Any kind of food better than another for any special winter feedings? coming down with Septicemia or is it water quality issue (explained in the next question). a natural way to keep my water buffered against pH changes? when I am unable to do a water change and have a sudden drop in pH. I also would like to stop using Seachem (under use since January) as it is making the algae out breaks very bad in the tank, algae is covering my whole plant and I haven't put in any new ones for this reason. 3). My third question is about algae, since Seachem uses phosphate based buffers it causes algae out breaks. Can you please let me know what kind of algae is purple in color, is like a stain and is very hard to remove, has to be rigorously scrubbed off from the glass and decorations using either credit card or tooth brush, I couldn't find any reference to such kind algae for fresh water. 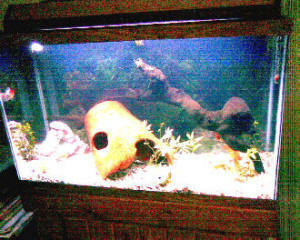 I have reduced the amount of light in the tank from 13 hours to 9-10 hours per day. providing us with such a huge amount of information on this topic. Thank you very much for all your past and future help.